As we continue our series on Municipal Transportation Projects, we look at the planning and programming phase. The importance of proper planning cannot be overlooked in any endeavor, more particularly one utilizing public funding. We will begin by looking at the various organizations and lists utilized by both the Commonwealth of Pennsylvania and the Federal government. 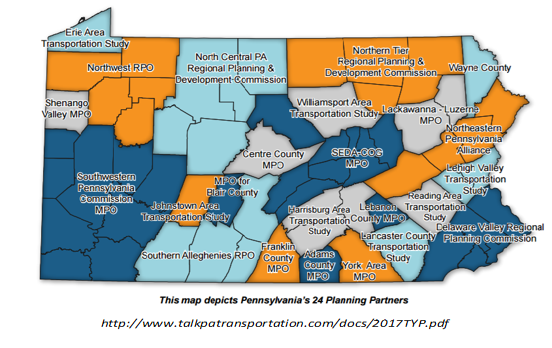 Metropolitan Planning Organizations (MPO) and Rural Planning Organizations (RPO) function as PennDOT planning partners on a local level, to find contact information for your MPO/RPO click here. be included on the Long-Range Transportation Plans (LRTP). LRTP is a financially balanced 20-year plan that serves as a basis for the development of a list prioritizing projects to be placed on the region’s Transportation Improvement Program (TIP). TIPs are 4-year plans, and when completed, all TIPs are compiled into a single list, Statewide TIP (STIP), and utilized as the official federal programming list. The Twelve-Year Plan (TYP) serves as a state programming document, prioritizing proposed transportation projects per both need and financial constraints. TYP is organized into three, four-year increments. 1. Money counts: Due to current fiscal constraints, cost estimates must be as accurate as possible, and projects must be fundable. 2. Choose projects with high-value-to-price ratio: The improvement must be justifiable under the following standards: need, fit within the community, and investment. 3. Enhance local network: Utilize existing structures, right-of-way, and alignments. 4. Look beyond Level of Service (LOS): Fit the solution to the project need, community/roadway type, and project complexity. 5. Safety first and maybe safety only: Safety is always the first goal, and for some projects, safety improvements may be all that are required. 6. Accommodate all modes: Consider solutions that address all modes of travel, not only vehicular. 7. Leverage and preserve existing investments: Existing infrastructure should be maintained and improved first. 8. Build towns, not sprawl: consider local planning and investments in existing infrastructure. 9. Understand the context; plan and design within the context: Respect the community character, how existing roadway is used, and understand “place”. 10. Develop local governments as strong land use partners: Integrate local land use planning with transportation planning; encourage local involvement in the process. The task of having a project placed on TYP may seem like a daunting task but it is not a task you must undertake alone. P. JOSEPH LEHMAN, Inc., Consulting Engineers can assist you in this process by developing accurate cost estimates and testimony which promotes the consideration of your project for programming. All municipal transportation projects much be on the TYP, in order to receive any federal or state funding. Recently, Barr Township in Cambria County, was able to have a bridge project listed on the TYP with the help P. JOSEPH LEHMAN, Inc., Consulting Engineers. Regarding the service P. JOSEPH LEHMAN, Inc., Consulting Engineers provided, Barr Township had this to say: “Within 30 days of meeting with Barr Township to discuss our failing bridge, P. Joseph Lehman, Inc. had members of the County Planning Department on site to field view and discuss programming our bridge on the Twelve- Year Program!” Mr. Giles Dumm, Barr Township Supervisor (20 years). In the next section, we will discuss the funding options for municipalities once a project has been programmed. Please don’t hesitate to call us at (814) 695-7500, if we can assist your municipality.